***Update 1/26/17 Moving these instructions to a new page. 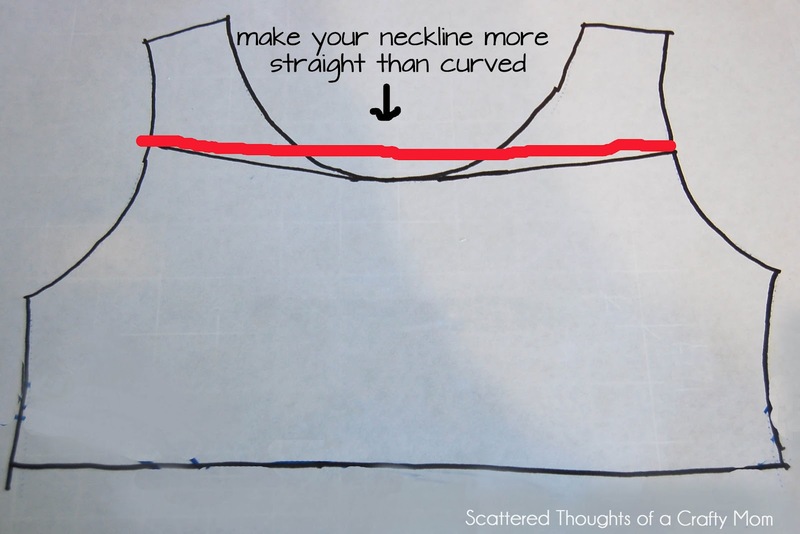 To create the basic bodice pattern, grab your t-shirt and trace it onto the paper. This will give you a basic shape you can tweak for different looks. 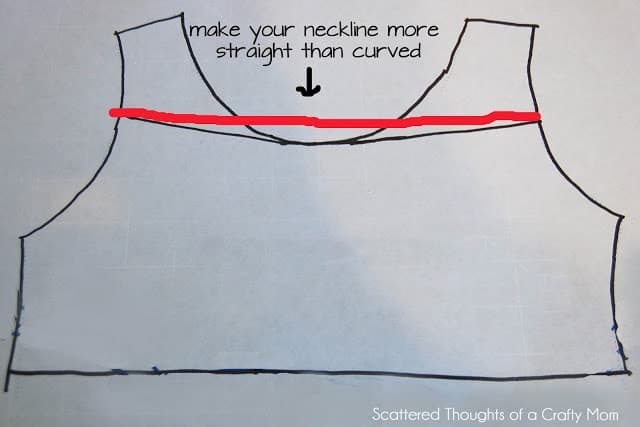 Adjust the neckline height as shown below in red. Fold the pattern in half and cut it out from one side. (This way the pattern will be symmetrical.) Hold the pattern up to your child and mark where you want the straps to be. If the straps are too wide, they will slide off her shoulders… (You can see my orange marks on the pattern below.) 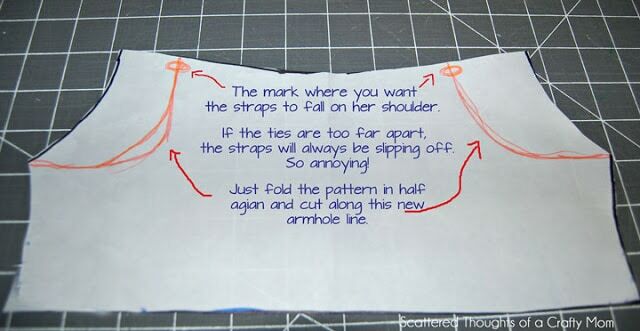 Fold the pattern in half again and cut along the new marks. 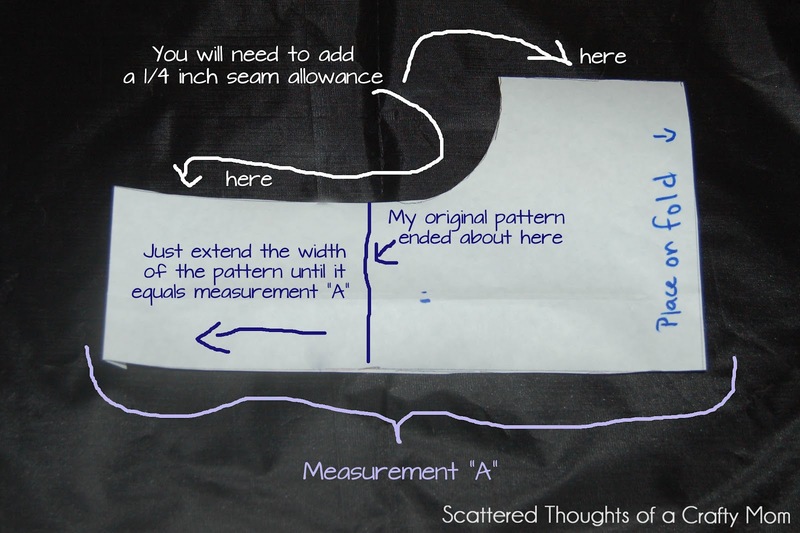 Modifying your basic bodice pattern for the Apron Top. Measure your child around her chest. Divide that measurement by 2 and subtract 1.5 inches. Then add back .25 for seam allowances. This will be “Measurement A”, and is how wide your folded bodice pattern should be. Fold your basic bodice pattern in half and trace it on a piece of paper, adding to the width as shown in the picture below. Cut out your bodice pattern. I wanted my bodice to be shorter, so I cut an inch off the bottom. (Actually, I just folded it, you can kind of see the fold line.) If you choose to shorten your bodice like I did, be sure to leave at least 1/4 inch for the seam allowance.